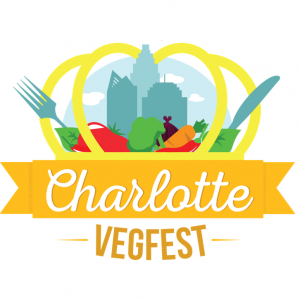 This year’s Charlotte VegFest will be held on October 13, 2018 from 11 AM to 4 PM in Freedom Hall at The Park Expo in Charlotte. Thanks to our awesome sponsors, there is no charge to attend the 2018 Charlotte VegFest! There is a $5 (cash only) fee for parking, so please consider carpooling. Cooking demos will be held throughout the day offering tips and tricks on creating vegan dishes at home. Click here for more information on the chefs and schedule. The first 200 attendees will receive a free 2018 Charlotte VegFest reusable bag with an awesome assortment of goodies. Stay up to date on the event page for Charlotte VegFest over on Facebook! 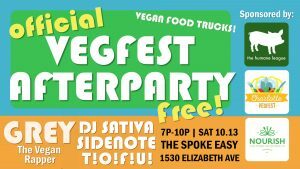 We are so excited to announce that the official Vegfest Afterparty will be back again this year for round 2, this time at the QC’s favorite bike shop and bar, The Spoke Easy from 7-10 PM after VegFest on October 13th! This year’s party will feature Charlotte based punk band T!O!F!U!, Sidenote, DJ Sativa, and GREY the Vegan Rapper! Juan Carlos Tacos and Jai Food will be onsite offering vegan goodness to keep you fueled for a night of partying! There’s no cover for the event itself but bring $ for food and drinks Charlotte Vegfest Afterparty 2018 has been graciously sponsored by The Humane League Charlotte and Nourish.